This woven basket made from denim looks great, doesn’t it? It’s a real eye catcher and a conversation piece that will liven up your kitchen decor without fail. If you like it, check out the tutorial for instructions on how to make one for yourself. Hexagon pattern adds a lot of decor interest to home decor. A wall painted in this patter is certainly a sight to see, but you don’t have to go all in to use the pattern. 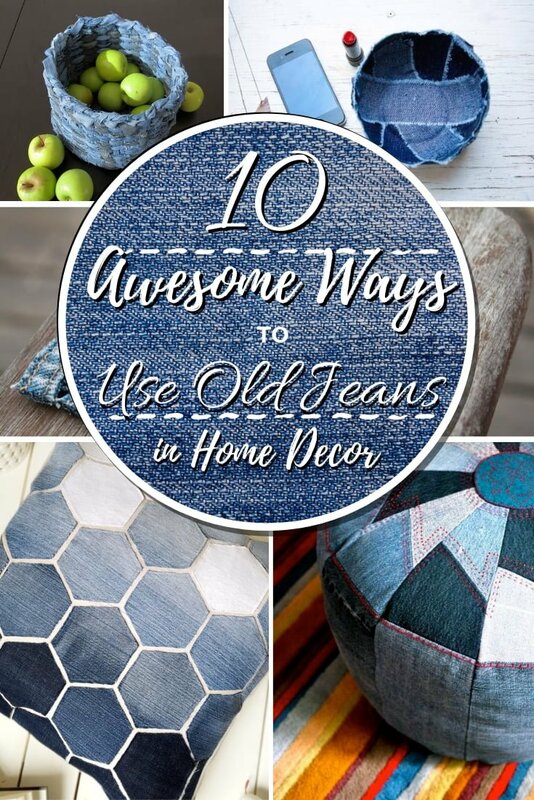 Hexagon pillows made from old jeans are just as interesting and visually appealing. Follow the tutorial to see how it can be done. You can make a real piece of furniture from a few pairs of old jeans and here’s how. This pouf is colorful and adorable, it adds new material as well as pattern to your home decor. It’s one of the best ways to repurpose old jeans ever. Check out the tutorial if you want to make it at home. You could always use another decorative bowl to collect all those small things around the house and keep the mess away. Such a bowl is easy on the eyes no matter what you keep in it and makes your decor interesting. So get some old jeans and let’s get crafting. One of the easiest DIY projects with old jeans is to make these little woven coasters. They’re easy and they’re interesting, so it’s just a lovely little project to take on. Check out the tutorial for instructions. Another great pattern to add to you home decor is chevron. And while you don’t have to tile or paint your walls in this pattern, you can use a few small accent pillows. Even if you make just one of them it will be a great addition to your home. You even get the tutorial to make it easier for you. 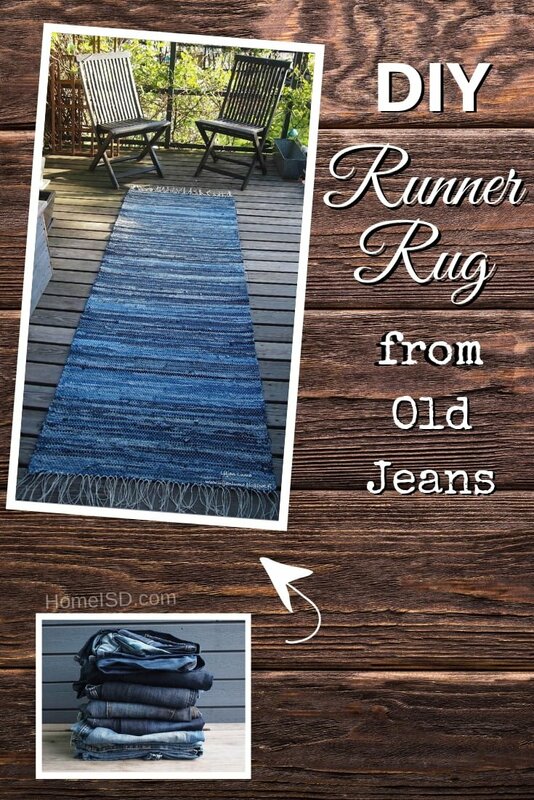 A runner rug made from old jeans introduces lovely blue tones and denim pattern to your home decor. If you see something like that working in your home, you have a wonderful DIY project coming up. And while this tutorial is not in English, you can still follow the instructions. 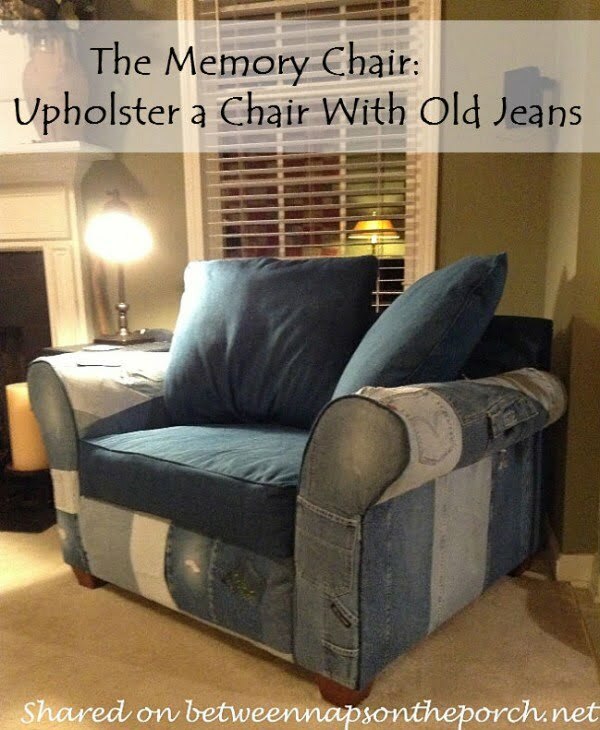 This has to be the easiest project from old jeans ever. All you have to do is make a spiral from a strip of denim and glue it together. Coasters made this way are lovely and you can make a lot of them in one go. Check out the tutorial for instructions. If you can do anything with the material of old jeans, then you can definitely upholster an old chair. Such a makeover is easy and interesting, making a unique piece of furniture. Check out this tutorial to see how it is done. Dress your flower planters in denim by repurposing your old jeans. It’s an easy project that doesn’t even require sewing (if you use glue) and it’s a great way to get into upcycling. Check out the tutorial for a DIY project.